Here's something interesting from my files. Medical personnel are fond of saying that you can't practice medicine like a business. They often believe that their work is unique and can't be easily optimized by industrial engineers. But there is some room for improvement. Take scheduling. What if you did today's work today? Worry about next week, next week. Don't try to schedule it today. A few doctors have started applying that principle in their offices and have found that their patients spend less time in their waiting rooms and spend less time waiting for an available appointment. And the doctors spend less time being overbooked and overworked. The concept is called "open access scheduling" and allows doctors to leave most of their time unbooked. [P]atients start calling at 9 a.m. and are assigned 15-minute time slots on a first-call, first-serve basis. Those who want a traditional scheduled appointment can try for the two to three hours a day he reserves for advanced bookings, usually for annual physicals or patients who need regular follow-ups. A few extra slots are left open for walk-ins or emergencies. This is the type of innovation and experimentation that you'd see more of, if patients paid for their care directly, giving them the freedom to shop around and consult different doctors. That kind of open ended market would also give providers more freedom to experiment with how they practice healthcare, rather than being tied to the rules of large HMOs and large group practices. John Goodman links to a recent (gated) study from the Health Affairs Blog. We examined both quality and actual medical costs for episodes of care provided by nearly 250,000 U.S. physicians serving commercially insured patients nationwide. Overall, episode costs for a set of major medical procedures varied about 2.5-fold, and for a selected set of common chronic conditions, episode costs varied about 15-fold…there was essentially no correlation between average episode costs and measured quality across markets. 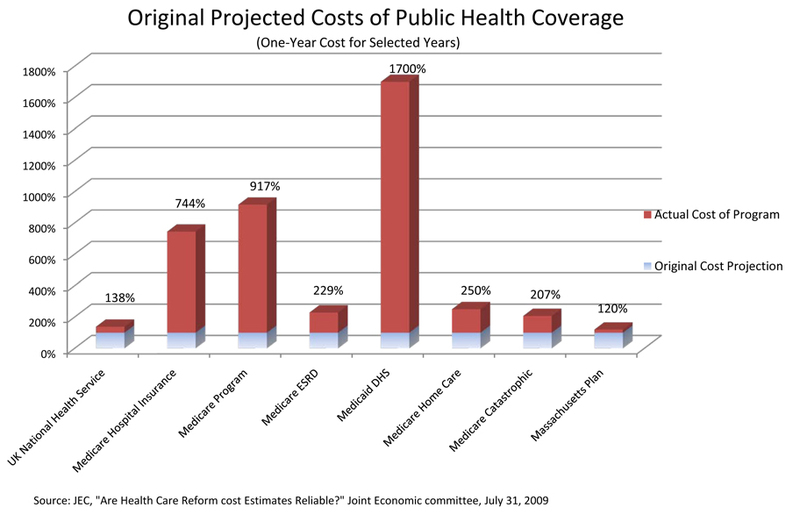 That indicates to me that there is a lot of room for patient's to bargain for healthcare and push for lower prices. If more patients spent their own money, they'd do so. 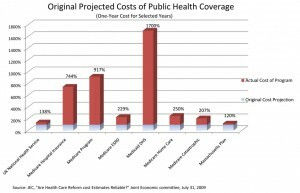 And, in so doing, they'd lower their own healthcare costs and the costs of the overall healthcare system. Steven Landsburg reminds people that prices actually represent something concrete in the real world. When the President demagogues against prices, he's playing the dunce because he thinks you're an idiot. This morning I heard President Obama call for universities to lower their tuition rates so that “everybody in America can go to college”. ... To believe what the President wants you to believe, you’d have to be not just stupid but badly misinformed. At the University where I teach, we do not lack for applicants. The reason we don’t have more students is not that they can’t afford us; it’s that we don’t have room for them. There are a couple of things that I really wish the general public would understand. One is that gas prices (and oil prices) aren't, broadly speaking, under the control of any President. No President gets to take credit for prices falling and no President should take the blame for prices rising. Is President Obama responsible for spiraling price of gasoline? Republicans say yes, but the facts say no. Why have gasoline prices increased since the start of the year? The simplest explanation is that the price of crude oil has increased. Specifically, the spot price for Brent (North Sea) crude has increased $16 a barrel since January. Given that there are 42 gallons to a barrel, that works out to a 38 cent increase in the price of a gallon of oil. Spot prices for gasoline trade in New York have increased about 41 cents per gallon over the same time frame. So there you go. Why is the price of North Sea oil relevant to the price of gasoline in the United States? Well, we import gasoline refined in Europe from North Sea crude. Even though these imports constitute less than 10 percent of U.S. gasoline consumption, they are necessary to satisfy domestic demand and their price sets the market price for all gasoline regardless of whether other cheaper crude sources are used to refine most of our gasoline. You can also listen to the podcast version of this article. Richard Epstein looks at the recent run up in gas prices and concludes that it's mostly because of an increasingly hostile posture towards Iran. Without question, the problem can be traced back to a renegade Iran. For good and sufficient political reasons, the West has come to see that the Iranian nuclear threat is not just bluster. Indeed, it poses far greater risks to world peace and the political order than even a major disruption in oil supplies. Hence an anxious West has now put into place a reasonably effective concerted effort to cut off Iran from the world’s banking system, and to block the use of Iranian oil internationally, which has been made easier by the Saudis’ willingness to expand their own shipments into the world markets. Nor have the Iranians sat back idly. They have cut off exports to the United Kingdom and France, a move that is largely symbolic. But the Iranian threat to close the Strait of Hormuz, through which about one-third the world’s oil supplies travel, is not symbolic. Nor is the movement of the U.S. aircraft carrier, the U.S.S. Abraham Lincoln, into the Strait of Hormuz, merely symbolic. For both the short and the middle term, these developments have driven the base-line price of Brent crude from the North Sea up to around $119 per barrel. That translates into a potential price at the pump of about $4.25 per gallon, which undoubtedly will eat into the pocketbooks of many Americans. He concludes that the worst possible thing, for gas prices, is for politicians to start looking for "something to do". (And, yes, he criticizes both Democrats and Republicans on this issue.) Rather, we should sit back and let individuals and companies figure out the best way to react to the increased risk and the possibility of sudden shortages. The question on the table is how best to respond to the disruptions in oil supplies, not to pretend that these disruptions do not exist. On this score, the great advantage of a market system is that it forces Mr. Coudle (and everyone else) to think hard about the relative value of the goods and services he consumes and to make cutbacks in a cheap and rational fashion. In both good times and bad, people are always having to decide which goods and services to spend their incomes on, and which to forego. Price movements give them an accurate, instantaneous, and impersonal picture of how other people value various goods and services. When oil prices rise, its least valuable uses are the first to drop out of the system. The decisions are typically made on a continuous basis, so that if some people find that they have cut back purchases by too much (or too little), they can increase (or decrease) their purchases in the next pricing period. Spurred on by these price increases, people can also make changes in their spending patterns elsewhere to offset the inconvenience of the higher prices for oil products. Purchasing a hybrid, insulating your home, and moving closer to work are just some of the many ways to save money. Good luck to Mr. Coudle, who provides an object lesson in how that task should be done. So why doesn't a hospital work better? The answer I think, is that the level of specialization in medicine has emerged from a process that has very few incentives to make sure that the level of specialization is as productive as it should be. There are very few informational feedback loops. Very little accountability. Sure, if a surgeon leaves a scalpel in your chest cavity and sews you back up, the surgeon bears a cost. And as a result, it doesn't happen very often. But the kind of errors that Arnold worries about, the kind of errors that I've worried about with my Dad in the hospital (and the kind I've seen made) are the ones that have little or no consequence to anyone other than the patient. These errors are built into the system. When a drug leads to unexpected side effects because the right questions weren't asked, when an opportunity for a safer treatment is missed, when an aggressive treatment for one illness weakens the immune system and leads to other problems, who can you blame? Who bears a cost other than the patient? You can blame the hospital of course, whatever that means, but the costs to the human beings who work in the hospital are small. There are no feedback loops within the hospital to reward generalists who look for the costs of specializations. And the reason there are not is because the patient is not the customer. The patient is not paying the bill. The financial incentives that do exist are coming from Medicare and Medicaid and the insurance companies. The normal feedback loops that protect the customer from error and greed and simple stupidity are missing. In a way, it's amazing it works as well as it does. It works as well as it does presumably because most doctors and nurses do care about the lives in their hands. But it's imperfect and could be much better.